All of the above problems can be resolved or improved with the addition of dental implants to help stabilize the denture. All that is required is enough bone to support the implant. Now that we can do small diameter, mini dental implants, very little bone is needed to make this treatment option available to you! 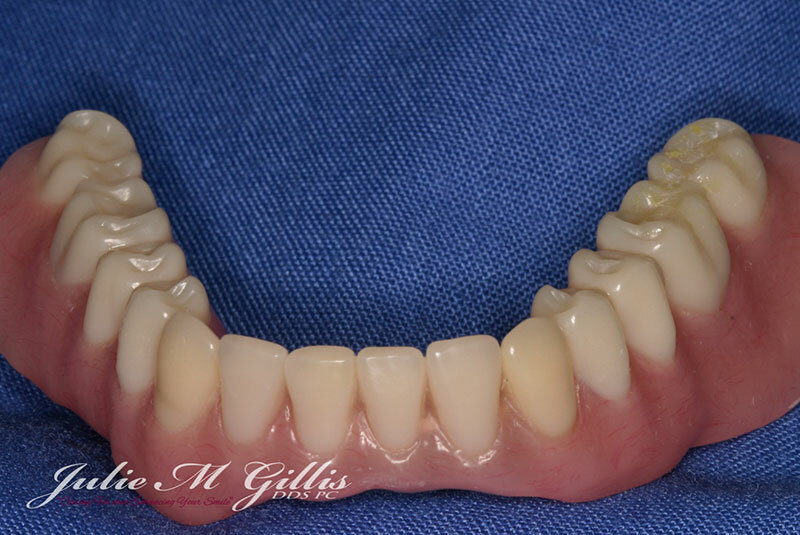 Implants that support or stabilize dentures come in many styles and sizes. Usually, the implant will have an attachment or shape that fits into an attachment inside the denture. The denture basically snaps in over the dental implants. 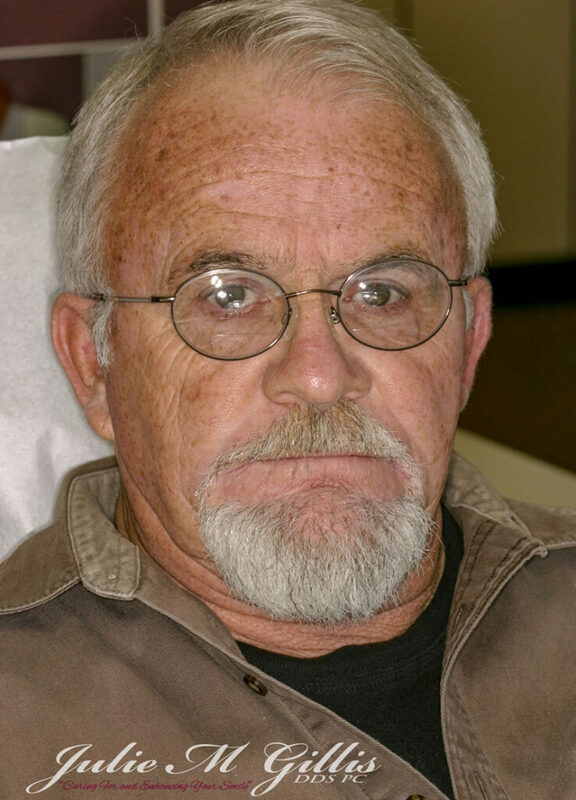 One of our patients, ‘Tom’, was basically so unhappy with his denture that he rarely smiled. He could not chew well and his mouth was uncomfortable. He explained it had been so long since he smiled, that he had forgotten how! Tom with old lower denture, pictured not smiling. Tom with new dental implant-retained lower denture, pictured smiling. 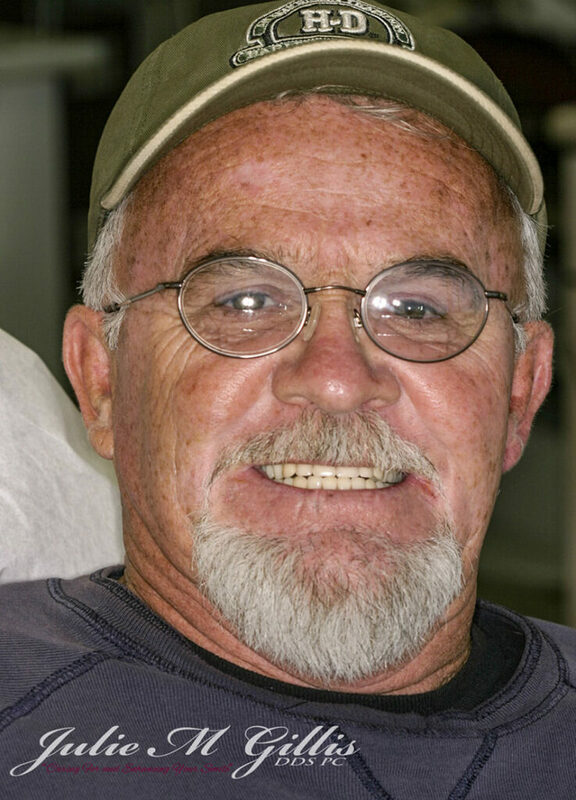 After having implants and attachments placed to hold his lower denture, Tom was all smiles! Four small diameter implants were placed with local anesthetic. You can see how little bone remains on his lower jaw to support a standard denture. Attachments were added to the inside of the denture to fit over the implants. 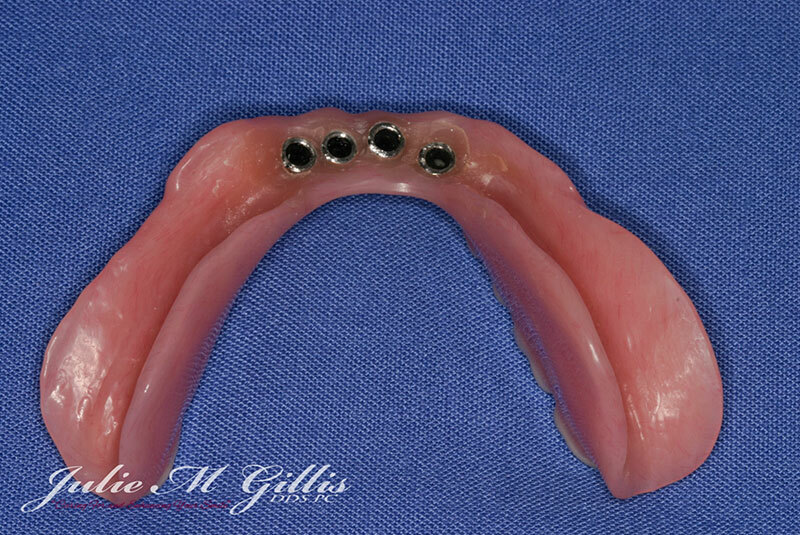 The new lower denture snaps over the implants and fits very securely. 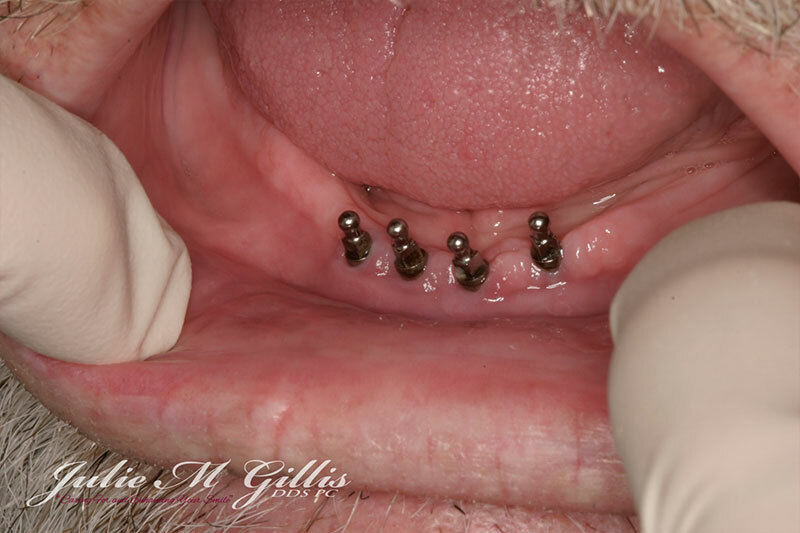 Four dental implants in Tom’s lower jaw. Tom’s lower denture in place. Tom smiling with lower denture in place. We can even use a combination of implants, the healthy roots of teeth, and attachments placed into the roots to support a denture. This allows us to create a denture that feels and looks more natural—and, more importantly, we can provide our patients with a custom solution to their tooth and denture concerns. By adding implants and attachments, a denture can chew food almost as well as natural teeth! 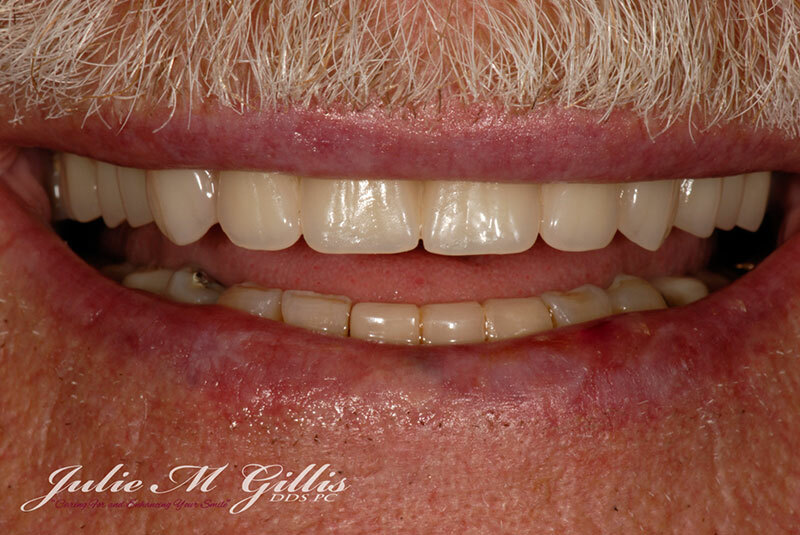 Patient smiling with new dental implant-retained upper denture. View of mini-dental implants and precision root attachment in patient’s healthy tooth roots and upper jaw bone. 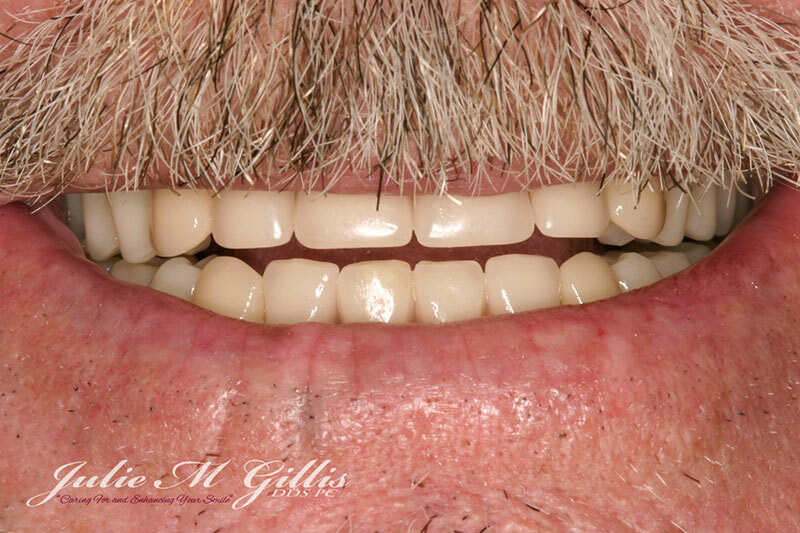 Our patient pictured above has an upper denture supported by small diameter implants and a precision root attachment. There are precision attachments inside the upper denture that fit exactly over these implants. The remaining roots help to stabilize the denture and maintain the surrounding bone. 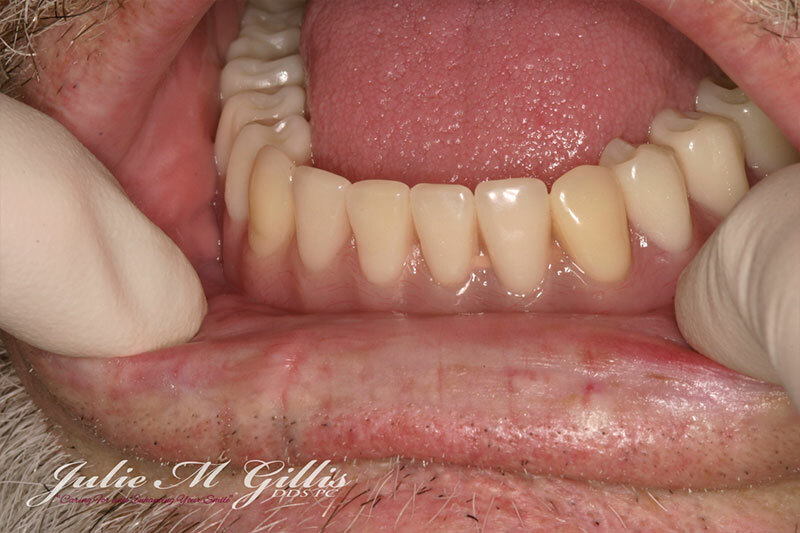 Our patient is very pleased with the additional support he feels by adding implants below his denture!